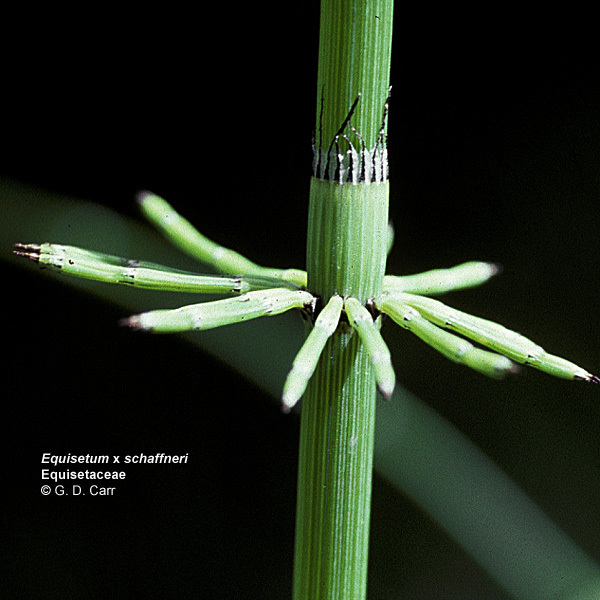 Equisetophyta (Arthrophyta). 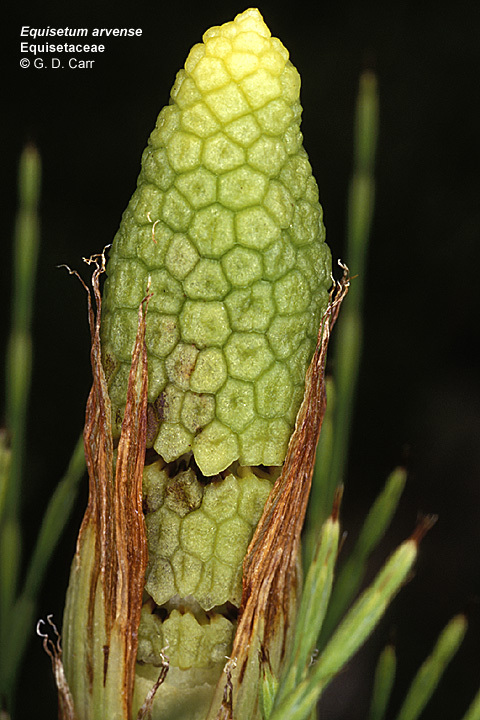 The Equisetaceae are terrestrial, herbaceous, homosporous vascular plants comprising a single genus with about 15 species. 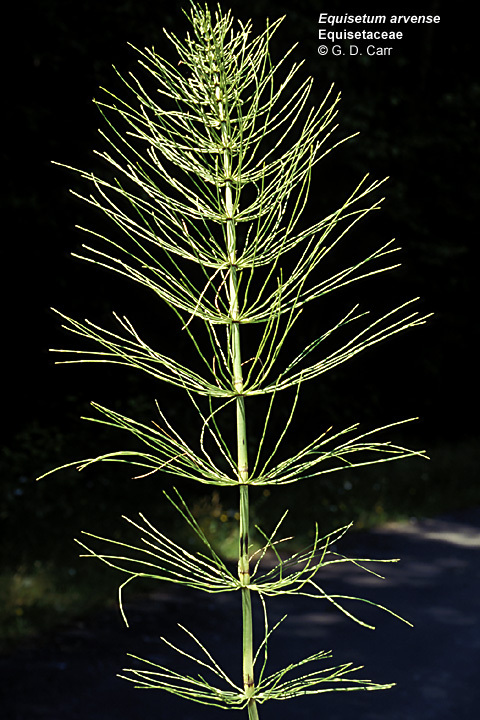 The free-living sporophytic plant body consists of a rhizome with adventitious roots, and an aerial portion with ribbed, silicified stems that are hollow except at the jointed nodes which bear whorls of reduced scalelike megaphyllous leaves, sometimes alternating with branches. Clusters of 5-10 eusporagia hang from the margins of umbrellalike sporangiophores that are aggregated into a compact strobilus at the tip of the shoot axis. In some species the fertile shoots have little chlorophyll and may also be differentiated from the vegetative shoots in other ways. The spores have 4 straps of tissue called elaters that uncoil from the wall and extend in response to a decrease in humidity, thereby facilitating spore dispersal. The free-living bisexual or male gametophytes are irregularly lobed, tiny ribbonlike photosynthetic structures, often found on the surface of mud. Multiflagellated sperm produced in an antheridium must travel through a film of water in order to reach the egg of an archegonium and initiate the zygote that may develop into a new sporophyte individual. 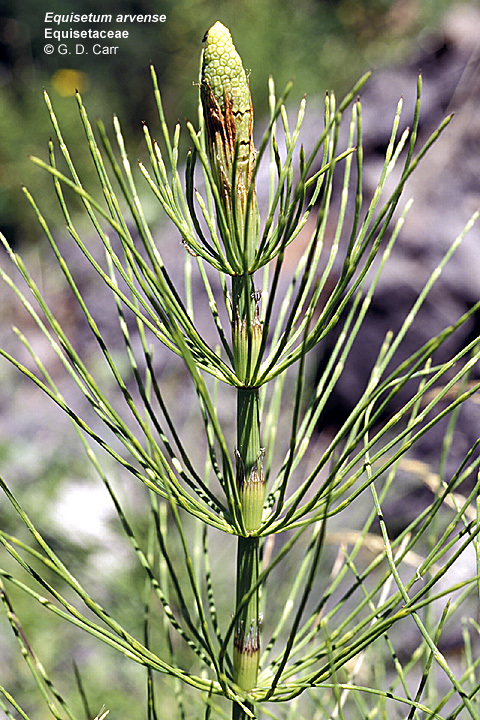 Equisetum arvense, horsetail. 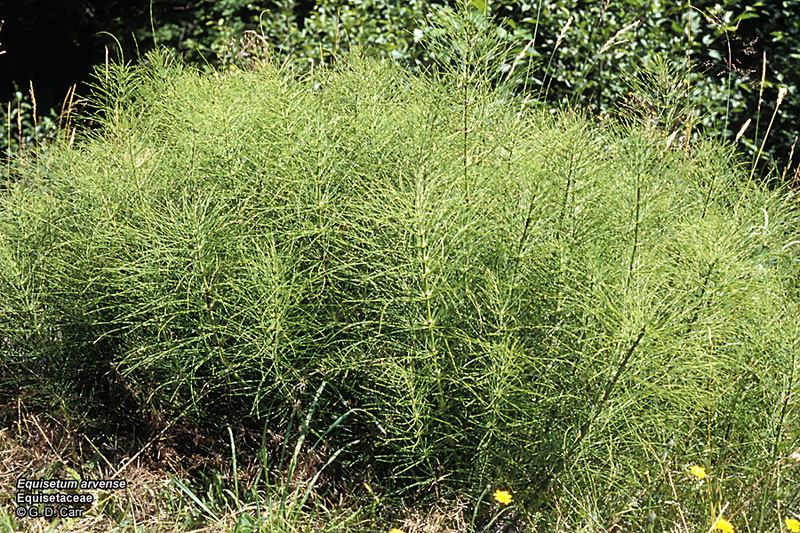 This species normally has the strobilus borne on short, non-green, ephemeral shoots that appear early in the growing season. The green shoots develop later, by which time the fertile shoots usually have wilted. 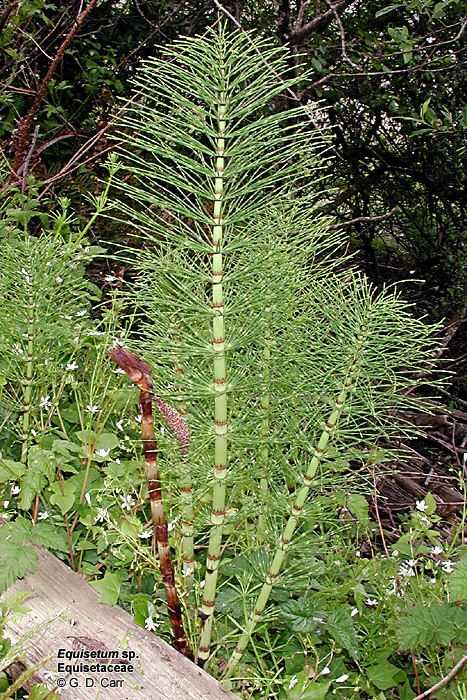 In this population, an aberrant green shoot with a developing strobilus was found long after the normal non-green fertile shoots had senesced. 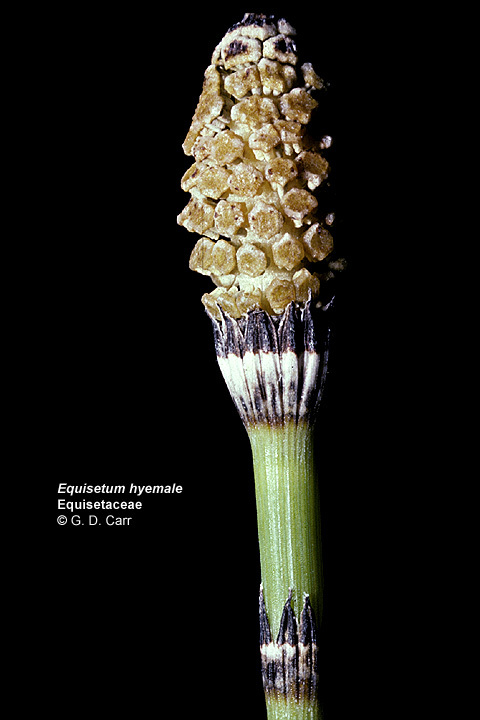 Equisetum hyemale, scouring rush. Whorls of leaves and the terminal strobilus are clearly visible. The amber colored umbrellalike sporangiophores are evident and a few pendulous pale yellowish sporangia are partially visible. 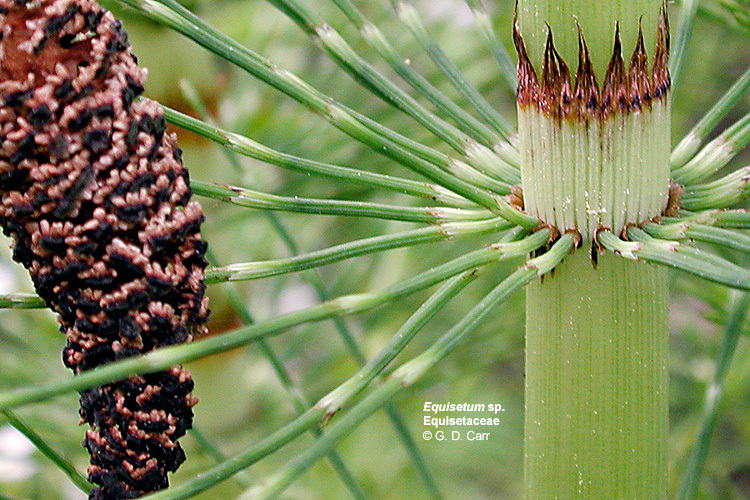 Equisetum telmateia, giant horsetail, vic. Newport, OR, 2002. 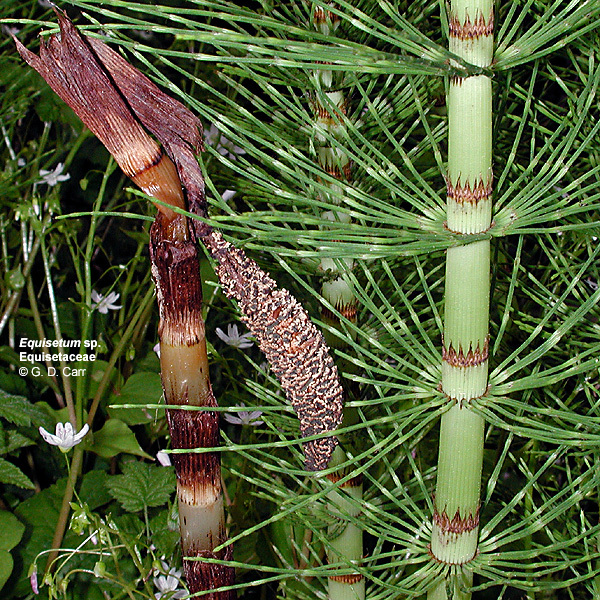 Equisetum x schaffneri (E. giganteum x E. myriophyllum), horsetail or scouring rush. Note whorled branches. 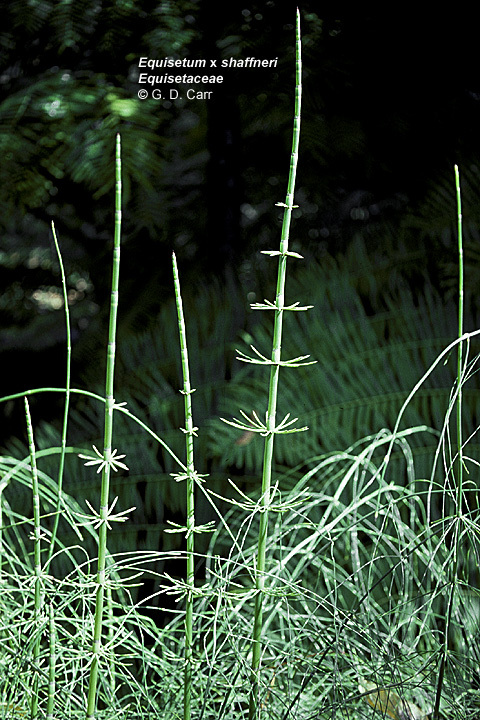 The stems are ribbed and are hollow except at the jointed nodes. Cells in the stem may be silicified or glasslike, contributing to the utility of the stems in scouring pots and pans, a quality that was exploited by pioneers in western North America.